Dr Joseph Duffy, our Chief Operating Officer. Engagement is an essential part of Jigsaw's work to change how Ireland thinks about young people's mental health. Through Engagement we aim to change attitudes to youth mental health in Ireland from one of stigma to one of openness. We want to increase the nature of family and community supports available to young people for their mental health, and to encourage the emerging voices of young people and to support these young people as they shape the debate and inﬂuence mental health policy. In 2015, through the blogs on our website and our Social Media channels, we’ve helped our young people be a part of discussions and campaigns on mental health, including World Mental Health Day and the Leaving Cert. We’ve supported young people to contribute to the national and international conversation on youth mental health, through events including the MacGill Summer School in Donegal and the International Association of Youth Mental Health Conference in Canada. We’ve included young people in Jigsaw’s governance. We’ve developed and provided training of community members in Jigsaw communities to empower community members to provide meaningful support to their young people. We’ve furthered our involvement in Irish policy formation related to youth and mental health. We established a Youth Advisory Panel (YAP) in 2006 and an Adult Advisory Panel (AAP) in 2011. The AAP advise on the challenges that parents or guardians encounter in supporting young people’s mental health. The YAP continued to work with Jigsaw to reduce the stigma that surrounds mental health and to identify issues that impact on young people’s mental health. YAP members also speak at public fora, nationally and internationally, on mental health issues for young people and the importance of young people’s involvement in decision making in systems and services that impact on them. They continued to work alongside many national voluntary and statutory agencies to strengthen the voice of young people in decision making. YAP members support the work of the organisation, and are involved in our fundraising and helping to promote what we do. Two nominated members of the YAP attend Jigsaw board meetings, and in 2015 we also invited YAP members to join our board sub-committees. Youth participation is a guiding principle of our work and is a central feature of the design and planning of all Jigsaw Services. Each Jigsaw Service has a local Youth Advisory Panel and there are representatives from local Jigsaw YAPs on the national YAP. In 2015 the YAP continued its work to strengthen the links between the 10 local Jigsaw YAPs, and the national YAP and in the summer convened their third annual Youth Learning Network where all 10 local Jigsaw YAPs and the national YAP came together to share learning and plan for a closer working relationship in the future. The 2015 Youth Learning Network was organised and project managed by the YAP themselves. Through our communications, we work with the YAP, ambassadors and the media to bring the conversation about mental health into the open. We use online communications and social media to reach young people and adults. Jigsaw is working in Ireland to promote youth mental health and we participate, as requested, in the development of government policy. I myself am a Ministerial nominee to the advisory council of the Better Outcomes, Brighter Futures - The National Policy Framework for Children and Young People (2014-2020), and was a member of the Strategic Planning Oversight Group for the new national suicide prevention strategy – Connecting for Life. Jigsaw continues to advocate at an international level as a founding member of the International Association of Youth Mental Health, and the staff and Youth Advisory Panel presented at the bi-annual conference in Montréal, Canada in October 2015. As a charity, Jigsaw relies on the support of the general public to continue our work, changing how Ireland thinks about and responds to youth mental health. We were truly amazed by the number of people that took on extraordinary challenges and raised funds for Jigsaw last year. People climbed mountains, ran marathons and drove over 10,000 miles in the Mongol Rally to name a few. Many more, held table quizzes, bake-sales and Christmas fairs in an effort to raise funds as well as awareness of youth mental health in their local schools and communities. We were delighted to be chosen as beneﬁciaries for the DCU Media Production Societies 24-hour broadcast which raised over €7,271 for Jigsaw as well as opening up the conversation about youth mental health on campus. We launched our ﬁrst Charity Abseil in Croke Park and were joined by 35 brave and willing Heroes who abseiled from the roof of the Hogan Stand and helped raise over €17,000 for Jigsaw. We were also joined by some famous faces from the world of GAA on the day. We strive to offer the highest level of care to all our donors, and all donations regardless of amount are gratefully received. The Youth Learning Network (YLN) is a youth led event that brings together the young people from all over the country who are members of each Jigsaw Services’ Youth Advisory Panel. Every year, Jigsaw aims to bring together all of the Youth Advisory Panel members for a day of learning and discussion. It is an opportunity for young people to meet like-minded individuals who are passionate and active in changing the mental health landscape in Ireland. Jigsaw Services have an opportunity to present their achievements from the past year and share knowledge of what has worked well. Open group discussions spark debates, and hopefully help people to take lots of new ideas back to their respective communities. About ﬁve years ago, young people felt that there was a lack of connection and communication between the Jigsaw Services, despite everyone working towards a common goal. A discussion was generated and it was proposed that once a year, a Youth Learning Network would take place to connect the Jigsaw Services and to get young people thinking about and discussing the future of mental health in Ireland. This was a youth led initiative and in turn was implemented by young people. The Youth Learning Network provides a platform for young people to have their voices heard on the national stage. It is a social and interactive day, and can provide a sense of belonging and community. It is a day where young people are at the forefront and their ideas and opinions are listened to. Each year, signiﬁcant progress is being made and it is an opportunity for young people to reﬂect on their contributions and the impact this is having on changing attitudes towards mental health in Ireland. It is a celebration of the change young people are making and the positive inﬂuence they are having at a local and national level. I was working in the position of the YAP intern for the summer of 2015, and one of my main goals was to organize the YLN. Preparations began at the beginning of the summer to ensure everything was incorporated for the day. I worked closely with the YLN organising committee, which comprised of representatives from each Jigsaw Service. To see how successfully it went on the day was a credit to everyone involved. Being part of organising the YLN 2015 was a huge learning curve. Preparations were so important from the get go and ensuring every aspect of the day was incorporated. I also learned about the platforms and resources that need to be in place to help facilitate a youth led event. The budget had to be carefully managed and monitored throughout the process. Organising people and ensuring that everyone had a role was very important to make sure that all jobs were completed and that the day ran smoothly. I think the main thing that I learned from the experience is to have a small, committed team who are dedicated to making the event the best it can possibly be. It was the ﬁrst time I led the organisation of an event to that effect and I’ve learned so much that will be useful in the future. The best thing for me about the YLN 2015 was that for the ﬁrst time it was one hundred per cent youth led. From the initial ideas and planning to the logistics of the day, young people were at the forefront and followed through until the end. I think this was a huge boost for youth participation, as while young people have always been involved, I felt that this YLN was a culmination of skills learned over the years to enable an event that was organised for young people, by young people. This was also evident from the energy and exuberance that was present on the day of the YLN. It was very colourful and stimulating and this all contributed to the atmosphere and success of the day. The highlight for me, was the positive feedback we received and to see the Jigsaw Services mixing together and enjoying themselves. Throughout 2014 the board worked towards full compliance with the Governance Code for Community and Voluntary Organisations in Ireland. Jigsaw was added to the list of organisations that are fully compliant with the code in January 2015. In our work at Jigsaw it’s imperative that we ensure we’re doing the right things, and then doing those things right. This sounds simple but it involves a number of big issues such as leading the organisation, exercising control in terms of compliance, ﬁnancial and management controls, managing risks, working effectively, behaving with integrity and above all being transparent and accountable. Enormous trust is placed in every member of our staff team, our Youth Advisory Panel and our Board takes care of how we run, direct and control our charity. Good process and procedures serve all of us in our work, it’s important we regularly review how we use our resources effectively. We abide by the Governance Code for the Charity and Voluntary Sector and our board has a sub-committee that pays particular attention to governance. These meetings are held six times a year and hold all of us to account. We also look to be open about how we are funded and how those funds are used to support the mental health of young people across Ireland. We categorise our income and expenditure in line with the categories as per the Statement of Recommended Practice (SORP Guidelines) for charities and non-proﬁt organisations. As a charity seeking donations from the public, we follow the Statement of Guiding Principles for Fundraising as set out by the ICTR (Irish Charities Tax Reform Group). We honour the trust placed in us by the young people, parents, communities and mental health professionals we serve, by being transparent, compliant and behaving with integrity. Effective governance at all levels serves us and makes sure that we realise our mission to change how Ireland thinks about youth mental health. We honour the trust placed in us by the young people, parents, communities and mental health professionals we serve, by being transparent, compliant and behaving with integrity. I have been involved with Jigsaw as a member of the Youth Advisory Panel (YAP) for the past three years, and ﬁrst got involved because I shared their passion, and wanted more young people to have access to a service that was different – one that makes everyone a priority, and knows that there is no problem too small to share. In October, I joined members of the Jigsaw team in a visit to Montréal to present at the IAYMH Conference. The aim of the conference was to bring organisations, professionals and young people together to promote public and professional interest in youth mental health, advocate for improved standards of care, and promote the advancement of research and education. A wide range of topics were discussed by professionals from all over the world. Presentations covered areas such as service models, social media, vulnerable and diverse population groups, suicide and self-harm, and countless other topics. These fascinating presentations and talks were delivered by some world renowned mental health activists, such as Professor Patrick McGorry and Dr Garry Blau. It was empowering to see Jigsaw’s representation throughout the conference, through our own presentations, chairing sessions, poster and table-top presentations. As well as this, our work was referenced throughout the conference by other organisations. It was with great pride that myself and Aoife could stand up and speak on behalf of the wider group of young people involved with Jigsaw. We spoke about the work that we have done, and how all of our voices have helped shape how Jigsaw works. 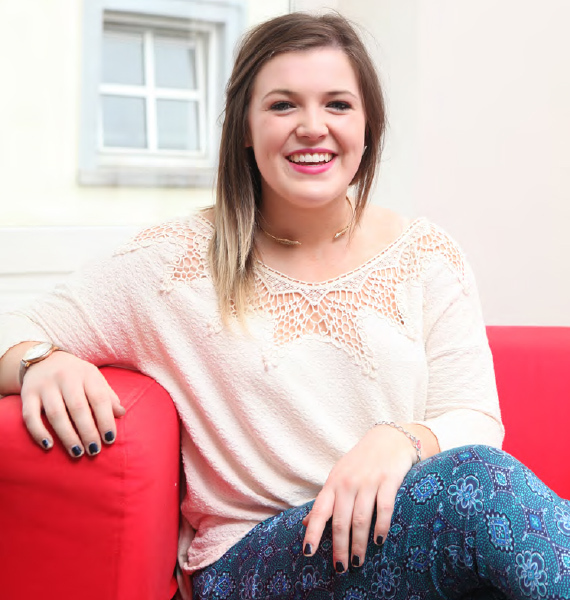 “I didn’t really know what to expect going to the IAYMH conference, but I was overwhelmed by the response to our work. We’ve returned with great conﬁdence. With Jigsaw, we truly are a world leader in the way we involve young people in what we do. Young people from all across the globe came to listen to what we had to say, to the work that we do. People were amazed to hear that as Youth Advisory Panel members we sit on interview panels for new staff members, and that we have a seat at every table, and join in on almost every discussion. Going to IAYMH was a once in a lifetime opportunity, and I am so grateful for the opportunity to go and present our work on such a big stage, and to be able to bring idea’s back to Ireland. It is inspiring to know that there are young people from all over the world returning to their own communities – wherever they may be, talking about Jigsaw. The MacGill Summer School began over 30 years ago. It brings people together to debate and discuss the issues of the day, including economics, health, public services, and more. So, we found ourselves travelling to the scenic village of Glenties, in County Donegal to take part in a workshop looking at mental health. The workshop we were attending was titled ‘Our mental health – A cause for hope or despair’. The fact that mental health was part of the agenda was very promising. It shows how far we’ve come, that it’s now openly recognised as something we need to seriously talk about to address what people’s needs are. Dr. Marie Murray highlighted how mental health problems are not isolated issues and do not occur in a vacuum, but are interrelated issues in our society. She outlined that it is based on a common thread and how close knit communities are the ﬁnest therapeutic clinics in this country. She drew attention to the title of the session, reiterating how mental health is a collective issue in society and how we all have an important role and responsibility in this. Drawing on our My World Survey research, she shed light on some of the prevalent issues that are facing young people in their lives and how this can spark many mental health difficulties at an early age. She also praised Jigsaw for putting young people at the forefront and providing resources at an earlier stage. Borrowing from the theme of the week, she concluded on the note that mental health in Ireland is at a crossroads, and how important it is for us all to come together to ensure that the right road is taken. The Minister of State, Kathleen Lynch, spoke about the idea of the ambiguity surrounding the language of mental health and in the commu-nication of messages. We are in the process of breaking down this stigma bit by bit, and how we need to focus on the strengths of the human condition – that we are survivors of survivors. She recognised the services that are taking active steps in providing support at an earlier stage, such as Jigsaw, and how these preventative services will have a large impact in the future. Dr Shari McDaid led the discussion and opened the ﬂoor to questions. It was encouraging to see that ﬁrst of all a session was dedicated to talk openly about mental health, but also the numbers that were in attendance against the backdrop of a rural Ireland setting. It provided a powerful portrayal of the spectrum of mental health and I think that in these forums in the future, more young people need to be in attendance and develop a better understanding of the mental health landscape in Ireland. Arthur Cox is one of Ireland’s leading law ﬁrms. “For over 90 years, we have been at the forefront of developments in the legal profession in Ireland. An international ﬁrm encompassing all aspects of corporate and business law, the ﬁrm has 350 lawyers and a total staff of over 700 in offices in Dublin, Belfast, London, New York and Silicon Valley. Arthur Cox was very pleased to be part of the Headstrong Heroes Campaign for Jigsaw in 2015 through sponsorship of the Charity Abseil Challenge at Croke Park. We enjoyed being involved with the abseil in 2015 so much, that we decided to sponsor the event again in 2016. Two of our staff members participated, and we hope that this will encourage even more people to take part next year. Why raise funds for Jigsaw? I live and work in London, which can be so busy. It is a great contrast to get out onto the peace and quiet of a mountain, it’s just brilliant. I really enjoy these kind of challenges where it is as much a mental challenge as a physical one. It’s amazing what you can convince your body to do when you’re in the right frame of mind, and it’s very empow-ering in normal life to know you can push yourself. I guess that is why I wanted to do this in support of a mental health charity, and use it as a way to do something positive and useful. I chose to support Jigsaw as I think it is fantastic that they are focused speciﬁcally on youth mental health needs, offering support directly to young people but also including and offering support to others concerned with young people, such as parents and teachers. I really like that they are concerned about changing attitudes; attitudes to how we view mental health issues, but also how we approach addressing them. We launched the challenge on Slieve Foye in County Louth in the early morning of July 24th. We then worked our way around Ireland and ended on Moylussa, in my home county of Clare on Sunday August 2nd. We climbed between two and four mountains every day to reach the target. There was a lovely mix of mountain highs and hills, so we were able to manage it. When you’re doing a challenge for a cause like this it requires a huge amount of support from family and friends. I was joined on the climbs by people from the four corners of the country, which was great. You can’t beat local knowledge, especially on more difficult climbs. Experienced Kinvara-based mountaineer Ronan Keane helped with the descent from the tricky Twelve Bens range in Connemara, this was particularly tough when visibility is poor due to fog or bad weather. I also got help from locals at Knockboy in County Cork, Galteemore, on the Limerick and Tipperary border, and in Mullaghmore, County Sligo, before being accompanied by 30 people to conquer Molussa in County Clare. While raising money is important, and I was proud of the amount that we raised, the challenge also generated huge public awareness about what Jigsaw does. In the end, even if it got just one person to look at the Jigsaw website for help, then the challenge was worth it. Raising awareness of Jigsaw’s work motivated me. I am familiar with certain areas of the Irish coast and I thought that this would give me the perfect opportunity to see more. Another source of motivation was to raise awareness for Jigsaw. I understand the signiﬁcance of youth mental health and saw this as an opportunity to help. I am a secondary school teacher of 25 years, and have seen ﬁrst-hand the struggles that young people are faced with. I also have two daughters in their late teens and early twenties, and I can see the trials of daily life that they come in contact with. They are growing up amidst a multitude of pressures with so much going on in the lives of young people today. I also think that Jigsaw’s One Good Adult® message is so important. I heard about it when I saw a friend’s coffee mug with the One Good Adult® branding. It made me think about what being that one adult means. Preparing for the challenge involved both physical and mental preparation. To know that you have the skills required puts you more at ease. We practised the skills needed to keep safe on the water. The uncertainty of the weather and the sea was also a constant concern and I worked alongside a sports psychologist, Dr Gerry McArdle. He helped me to learn how to manage fears and emotions, and build the belief in myself to handle situations that I lacked conﬁdence in. Apprehension was most prominent beforehand, as I had the time to overthink about what could go wrong. However, when you are on the water you are taking it moment by moment and enjoying the experience. Finally, it was so important to have the preparations completed in order to travel around the coast. We collected all equipment, maps and tidal information to keep to our plan. The scale of what we have achieved is still quite new to me, so I am still trying to take it all in. When you are paddling for seven to 10 hours a day, you are not thinking about anything too much, but I found it gave me a greater sense of clarity about my life. It also taught me a lot about inner strength. Give yourself the space to let things happen. Kayaking is a slow sport, nothing happens quickly, it is tough and requires a lot of physical endurance, but it is through moments like these when you appreciate the wonder and beauty of it all. I set out to help raise awareness about Jigsaw – to convey that it is okay to ask for help. We met some really kind people along the way and the general kindness of strangers served to reinforce my respect for humanity. We spent 46 days all together on expedition. We were mainly self-sufficient and we carried all equipment and food with us. On our longest day, we travelled 64km and our longest single paddle was crossing Donegal bay, which took seven hours to travel 54km. Having achieved this goal, I can take away a number of learnings that will have an impact on many different aspects of my life.